Today I arrive in Germany with one goal in mind: to make global health and development part of the public debate ahead of the national elections in September. I’m excited to spend time with the ONE Youth Ambassadors who, as part of ONE’s Ich Schaue Hin! Campaign, are holding German leaders to their promises to end global poverty and disease. We’ll be gathering in front of the Reichstag tomorrow at 10:45 am to spread this message. Dieser Beitrag wurde am 27. Juni 2013 von Team Wöhrl in Gastbeiträge veröffentlicht. 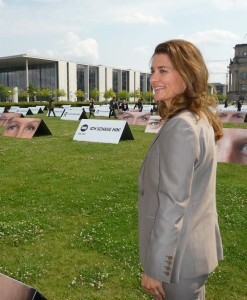 Schlagworte: Bill Gates, Frauen, Gastbeitrag, Kinder, Melinda Gates, ONE.